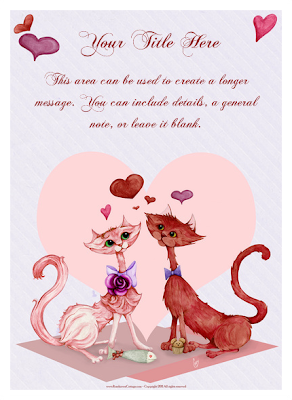 Rosehaven Cottage: Blog Giveaway: School-style Valentines featuring "Kitty cat love"
Blog Giveaway: School-style Valentines featuring "Kitty cat love"
I had so much fun painting my "Kitty cat love" Valentine illustration. 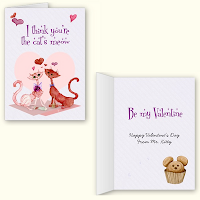 I love kitty cats, and I love Valentine's Day so the pairing of the two seemed perfect. 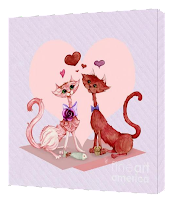 My illustration shows Mr. Kitty giving a chocolate mouse (not mousse) truffle to his Valentine Miss Kitty who has a red-bowed fish to give to her beau in return. To celebrate the completion of this illustration, I had some sweet "school style" Valentines printed so I could host a giveaway here on the blog! What's fun is that there will be more than one winner! There will be five winners! 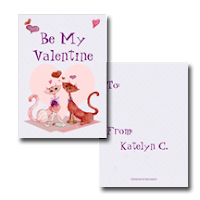 Each winner will receive a pack of 20 "school style" Valentines (2.5"w x 3.5"h) like the kind I loved exchanging with classmates when I was in elementary school. If you don't have an email link connected to the i.d. you use to leave the comment, then you'll have to check back on February 2, 2011 to find out if you won and then contact me via email so I can get your postal address privately. If you do have an email link connected to the i.d. you use, then I will contact you off the blog as well as announce you as the winner. Basically, it's the standard blog giveaway rules that are out there in the "blog-o-sphere" already. Oh! Forget the kids ... I want to give these to my friends. I do adore this illustration! Those would be great to send to school with Kyle. Oh wow! You have amazing talent. Those cards and the illustrations are so cute. I would love to win this to share these with my girlfriends.